The LORD is my strength and song, and he is become my salvation: he is my God, and I will prepare him an habitation; my father's God, and I will exalt him (Exodus 15:2). Then Samson prayed to the Lord, Sovereign Lord, remember me. Please, God, strengthen me just once more, and let me with one blow get revenge on the Philistines for my two eyes (Judges 16:28 NIV). God is my strength and power: and he makes my way perfect (2 Samuel 22:33). 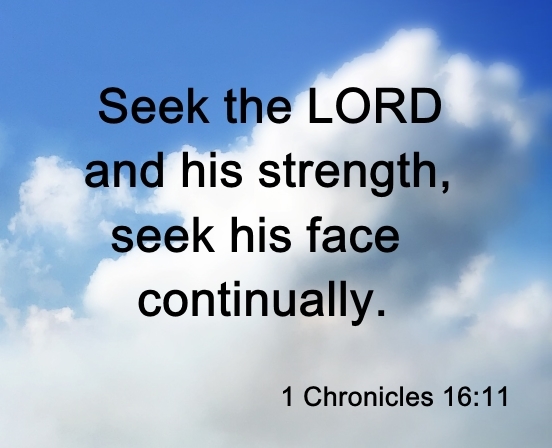 Seek the LORD and his strength, seek his face continually (1 Chronicles 16:11). Then he said unto them, Go your way, eat the fat, and drink the sweet, and send portions unto them for whom nothing is prepared: for this day is holy unto our Lord: neither be ye sorry; for the joy of the LORD is your strength (Nehemiah 8:10). God arms me with strength, and he makes my way perfect (Psalm 18:32 NLT). But you, Lord, do not be far from me. You are my strength; come quickly to help me (Psalm 22:19 NIV). Honour and majesty are before him: strength and beauty are in his sanctuary (Psalm 96:6). A wise man is strong; yea, a man of knowledge increaseth strength (Proverbs 24:5). If you fail under pressure, your strength is too small (Proverbs 24:10 NLT). Strength and honour are her clothing; and she shall rejoice in time to come (Proverbs 31:25). God, the Lord, is my strength; he makes my feet like the deer's; he makes me tread on my high places. To the choirmaster: with stringed instruments (Habakkuk 3:19 ESV). And you shall love the Lord your God with all your heart and with all your soul and with all your mind and with all your strength (Mark 12:30 ESV). But I have prayed for you that your faith may not fail. And when you have turned again, strengthen your brothers (Luke 22:32 ESV). For when we were yet without strength, in due time Christ died for the ungodly (Romans 5:6). I pray that from his glorious, unlimited resources he will empower you with inner strength through his Spirit (Ephesians 3:16 NLT). And after you have suffered a little while, the God of all grace grace, who has called you to his eternal glory in Christ, will himself restore, confirm, strengthen, and establish you (1 Peter 5:10 ESV). Saying with a loud voice, Worthy is the Lamb that was slain to receive power, and riches, and wisdom, and strength, and honour, and glory, and blessing (Revelation 5:12). And I heard a loud voice saying in heaven, Now is come salvation, and strength, and the kingdom of our God, and the power of his Christ: for the accuser of our brethren is cast down, which accused them before our God day and night (Revelation 12:10).